DJ in Swansea, serving Cardiff, Bridgend, Neath, Llanelli, Port Talbot, Carmarthen, Tenby and Aberystwyth. 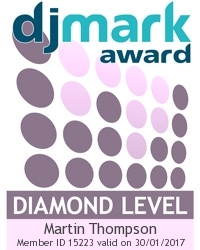 Diamond Dust was established in 1975 is probably one of the longest running DJ services in South Wales. We ensure that requests are played and play music that makes you want to dance. YouTube Channel - see some of our gigs. Our children’s entertainment has games, a parachute, and magic and has robots. We have an Educational workshop for Schools linked with STEM. Have a look through our website for more information. We make sure that the party or birthday person is an important member of the party, ensuring that this is their special day. Interaction with the audience is paramount. When you look through our website, you will see that everything is transparent. All our crew are shown on the website. We have a landline and mobile numbers. Martin has a DBS (formerly known as CRB) check, QTS (Qualified Teacher Status), qualified in first aid and a member of Equity. The equipment used is of professional, industry standard and has a PAT certificate (Portable Appliance Testing). We play main mainstream music and keep it suitable for the age range, whether we are a party DJ in Swansea or a wedding DJ in Cardiff. We ensure that Health and Safety practices are maintained and developed. Martin has vast experience of working with children in mainstream and special needs in both educational and care settings. His training includes Special Needs and Autism.